Sakai Guides and DocumentationSakai Basics Profile ToolHow do I search for and add connections? Select the Profile tool from the Tool Menu in your Home area. Or, you can also go to Connections to view/search from there. 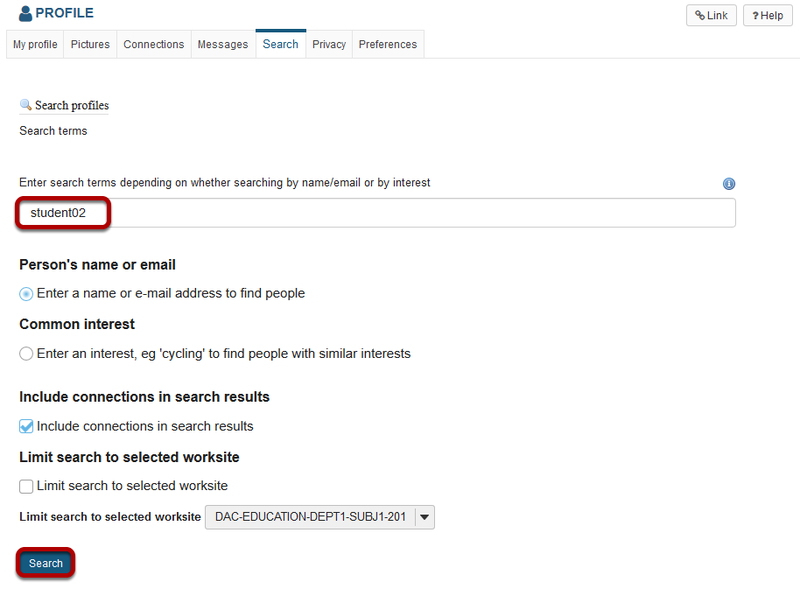 Then, click Search for Connections. Zoom: Enter your search terms. Enter a name or keyword to search for, and then click the Search button. Note: Optionally, you can choose to search by name/email, or common interest. You may also include current connections, or limit the search to a particular course by selecting it from the drop-down menu. Search results will display at the bottom of the screen. Click the Add as a connection link to send a connection request to the selected user. You will receive a notice letting you know that the user you have contacted will have to confirm the request before being added as your connection. To proceed with the connection request, click Add connection. Note: Once you have sent a connection request to someone, you will see the text "Connection requested" displayed for that user until they accept or ignore the request. Prev: How do I add pictures to my profile picture gallery? Next: How do I accept a connection request?